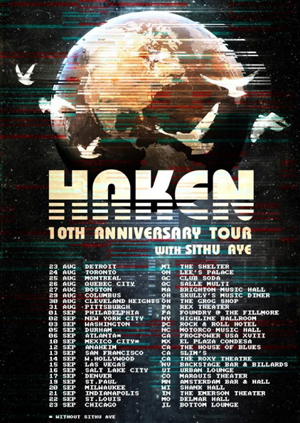 HAKEN recently completed their European tour celebrating their 10th anniversary and now they have announced dates through North American beginning August 23rd in Detroit, MI. The band have released a video message which can be seen bewlo. The band recently reissued their first two albums Aquarius and Visions as brand new remastered editions. Buy limited colored vinyl and the 2CD digipak HERE. Vocalist Ross Jennings commented on the releases: "As advocates of the physical format and fellow record collectors, it seems almost criminal that our first two albums have never had a vinyl release until now, so we are thrilled to finally give these albums a fresh presentation on the format they deserve. We have taken this opportunity to polish the sound of our beloved concept albums without going back over every little detail and rewriting history. In essence we wanted to give these albums a chance to stand shoulder to shoulder in sonic quality with The Mountain and Affinity. In addition to this and due to popular demand, both releases will also be available again on CD with instrumental, or "Karaoke" versions of every track. This release marks 10 years since we formed the band and started putting together our first demos so it's a perfect time to reflect on these releases and appreciate what we've achieved so far. The Aquarius concept was drawn from conversations about our favourite albums and the way in which the songs flow that make those particular records work. This lead to ideas about having our album be about the flow or journey of water from mountain spring to oceans and evaporation, which in turn lead on to a deeper concept about human life and reincarnation. The themes of water helped us to create aqueous soundscapes and as the music and lyrics started coming together a narrative was formed in the shape of Mermaids & natural disasters. "Aquarius" will always have a special place in our hearts. It's where our journey really began. When writing for Visions came around, we set about the process with the same formula, although we hadn't set out to write another concept album at the time. As themes found themselves recurring in the music it only felt right to go in the narrative direction, although this time around we drew from our science fiction influences such as Minority Report and 12 Monkeys and was inspired by real recurring dreams I had been having around the time. It's always a joy to revisit these tracks in our live sets, so much so that we will be performing it in its entirety later this year at ProgPower USA, Atlanta!" Newly remastered by the renowned Jens Bogren, both are available as 2CD Digipaks, digital album including the entire albums as instrumentals, and on vinyl, arriving as Gatefold heavyweight 2LP editions with the full album on CD included.